In any environment, it's important that you're able to clearly see your hand placement throughout examinations. The SafeDon GX670 Powder Free Vinyl Examination Gloves are transparent in design. This allows you to more accurately see where your hands are placed. The watertight test shows that the GX670 Vinyl Examination Gloves gained AQL 1.5 in EN 374-2, meaning it achieved a general inspection level one. This makes the gloves suitable for medical use. ASTM G1671-7 tests whether the gloves are resistant against penetration by blood-borne pathogens. No visual penetration was found with the SafeDon GX670 Examination Gloves. With the exception of fatty foods, these gloves have been approved for coming into contact with food. As such, they're suitable in most catering or restaurant environments. The GX670 Examination Gloves are designated Category III gloves, meaning that they should be suitable for most high-risk tasks throughout examinations. Constructed from PVC plastisol, the gloves are ideal for those with an allergy to latex. 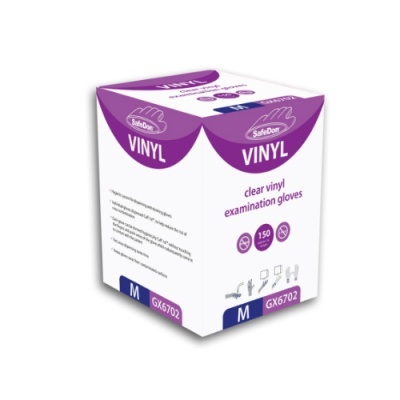 The SafeDon Vinyl Examination Gloves are available in four sizes to fit the hands of most users. To find out which size you require, measure your hand across the palm at the widest part and refer to the sizing chart below. The minimum glove length is 240mm.